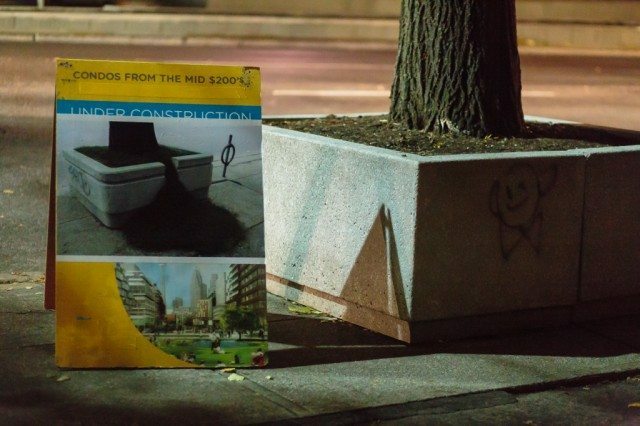 Irritated by condo ads on downtown sidewalks, some Toronto artists have taken matters into their own hands. Toronto artist Sean Martindale has never been fond of street advertising in any of its forms, but there’s one type of outdoor ad that he holds in particular contempt. “I’m concerned about advertising in our public space in general,” he said, “but condo ads are ones that are particularly invasive, I find. They’re taking up physical space on our sidewalks, and they’re getting to be more and more aggressive with it.” The worst, he says, are those A-frame “sandwich board”-style ads that physically block sidewalks, turning the city’s streets into obstacle courses for pedestrians—and especially for people in wheelchairs. He’s counted as many as 40 of the signs at a single downtown intersection. On top of his other objections to condo ads, Martindale alleges that many of the signs are placed on City sidewalks illegally. Toronto’s municipal code severely restricts where and when sandwich boards can be displayed, and the City’s bylaw officers regularly bust business owners for using the ads without proper permits. That’s why Martindale’s latest project—it’s titled Overboard Additions, and it’s a collaboration between himself, Adam Krawesky, and Martin Reis—uses those very same sandwich boards as art materials. The idea is simple enough: the three artists kidnapped a few dozen condo sandwich boards from sidewalks around downtown Toronto, then modified them. They covered up the images of gleaming condo buildings with some of their own photography. They also used stickers to block out corporate logos. Then, over the course of the past week, they returned all the hacked sandwich boards to different downtown locations, positioning them for maximum effect. Instead of condo buildings, the modified sandwich boards show street scenes. In some cases, the artists even plastered over the sandwich boards with pictures of other sandwich boards. The project is an attempt to turn the medium back upon itself, by using ads to call attention to ads. In the process, of course, the artists have placed illegal sandwich boards in a number of locations where they didn’t previously exist, arguably perpetuating the problem. In any case, Martindale maintains that it’s all for an honourable cause. The artists have installed 36 of their sandwich boards around town. A map of the boards’ locations is here. Our photographer tagged along as some of the signs were being installed on Monday. Click through the image gallery for a look. What Does it Mean for Graffiti to be Erased?